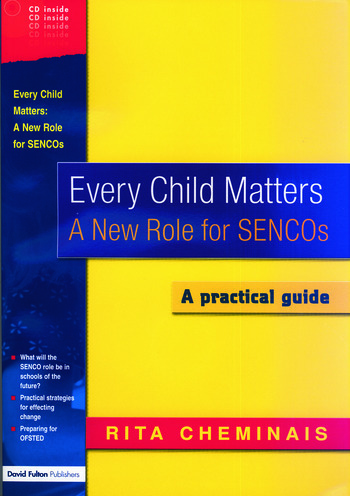 Every Child Matters is an essential and ground breaking resource for SENCos and senior managers which will enable them to meet the new and diverse roles emerging for them as schools develop. Based on the latest national legislation and developments in education, the book provides practical information and guidance in how to respond to the exciting challenges and opportunities that lie ahead. workforce remodelling to reduce bureaucracy in special educational needs. Every Child Matters is accessible and user-friendly with an accompanying CD and photocopiable sheets to support busy practitioners in solution focussed whole-school decision-making. For all those involved in supporting schools in responding to new ways of working – advisers, inspectors, educational consultants, educational psychologists, health and social services professionals. Rita Cheminais is a senior adviser for SEN in Cheshire Children's Services.